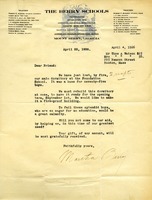 A letter to Elsie Ford from Martha Berry, thanking her for her gift of jelly and sympathizing for her on the problems at Possum Trot. Charlotte writes on behalf of her mother to thank Miss Berry for the jelly for her mother and the lavender sachet she received at Christmas. 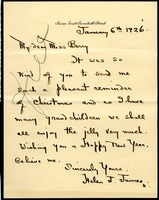 A letter from Elizabeth Vankirk to Martha Berry thanking her for a gift of jelly and wishing her school good luck in the coming year. 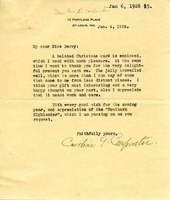 This is a letter from Mrs. Herman F. Vickery to Martha Berry. 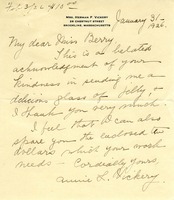 Mrs. Vickery is writing to Martha to thank her for a glass of jelly she sent her. W.S. Ransom sends a check for $25 to be used towards the rebuilding of the dormitory burned in the fire. 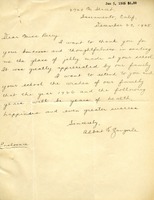 He also thanks Martha Berry for the jelly he received at Christmas time. Mrs. McLain thanks Martha Berry for the glass of blackberry jelly and the Southern Highlander magazine she received. 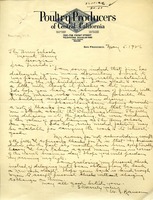 She wishes Martha Berry the best and congratulates her on her work at the Berry Schools. 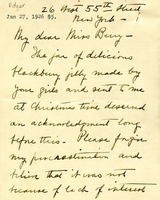 Pedra Edgar writes to Martha Berry thanking her for the jelly the girls made. She apologizes for how long it took her to acknowledge the gift. She also sends $5 and apologizes it couldn't be more. Mrs. Carpenter thanks Miss Berry for her Christmas present (jelly) which traveled well. Mrs. Carpenter encloses: a $5 gift, a Christmas card, and promises to share her Southern Highlander with her friends as Miss Berry had requested. 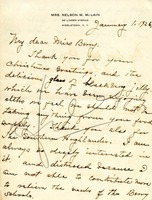 Letter thanking Martha Berry for the jelly she sent her for Christmas. 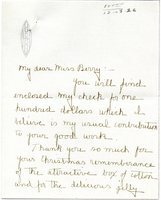 Mrs. Hardenbergh thanks Martha Berry for the box of cotton and jelly she received at Christmas time and sends a $100.00 contribution in return.